We know about hardy citrus on trifoliate and Flying Dragon trifoliate rootstock, but how much do we know about hardy citrus on other trifoliate hybrid rootstocks? How do you think hardy citrus would do on Tai-tri or US 852 (Changsha x trifoliate) ? I've just been enjoying a few Shasta Gold mandarins. I have to say, this is one of the best varieties, in my personal opinion, and I'm not a fan of most mandarin varieties. I'd probably rate this my 2nd or 3rd favorite mandarin variety after Satsuma and Kishu. The fruit size is very big, it's easy to peel, the skin is a deeper reddish-orange color. The fruits have a characteristic flattened shape. The flavor is very tangy, aromatic in the way of an orange, a bit tart and very flavorful. I'd say the level of aromatic aroma is almost as high as a Page mandarin, while the type of aroma is maybe somewhere in between a Page mandarin and an orange. These are very nice to snack on. I've read some comments from a few people saying that Shasta Gold has an off-taste, but I don't think this is so. Might just be a personal preference thing. Shasta Gold is a triploid variety, which explains its seedlessness (there might only be 1 seed out of every 5 fruits). I've tasted Tahoe Gold and didn't think it was as good, not really anything special. Just for additional comparison, I'm not a big fan of Gold Nugget, despite all the hype and some people claiming they're really good. I've tried growing two Shasta Gold plants from seed but the seedlings from this variety seem to be very week and don't grow very well for some reason. Cold Hardy Citrus / Might Kaffir Lime be hardier than we think? Enjoying some Nova Lee mandarins. The flavor is reminiscent of Page mandarins, but the flavor is a bit more subtle. Makes for a good dessert mandarin. It's not too difficult to peel, though not quite as easy to peel as some of the other "zipper skin" mandarins. Seems to be completely seedless. Altogether, I'd say this is one of the better varieties of mandarin. One to include in your collection if you're only growing four or five varieties. Something about it almost sort of reminds me of a dekopon. These are some pictures of a Citrange growing in the Philadelphia area, outside unprotected. Supposedly this variety is actually a cross between a Mandarin and a Citrange. It was planted in 2003. It died back one winter a few years ago and has probably since died completely in the severe 2017/2018 winter. It's semi-evergreen, meaning only maybe 20 percent of the leaves yellow in fall. There are thorns in there too. Some of the leaves appear to be trifoliate. The first fruits appeared in 2007, and there were three fruits that year. The next year there were twelve, and thirteen fruits the year after that. The fruits even get a chance to ripen to nice glossy orange. They contain plenty of seeds. Unfortunately they taste bitter and sour, not very edible. I don't know if there's any chance this tree could have been a Dimicelli. The original post said his tree was a cross between a Mandarin and Citrange. I have a Dimicelli seedling and from the research I've been able to dig up about it it supposedly came from a cross between Temple orange and poncirus, which was then crossed with a Clementine. Yuzu has a really close genetic relationship with C. ichangensis, it may even be descended from it (possibly as a result of genetric introgression from another C. reticula-like citrus species). Some see Yuzu as a C. ichangensis hybrid (constituting an Ichandarin), although it's certainly not a direct hybrid. Yuzu isn't quite as cold hardy as C. ichangensis, maybe but it is a more vigorous and fast grower and can easily recover from damage. Also the leaves of C. ichangensis smell nothing like Yuzu, although they do share a same distict "deepness". Otherwise the smell of C. ichangensis leaves are very mild (maybe a bit like Kaffir lime leaf) and a bit lemony. The leaves of Yuzu are practically like petitgrain (strong, green, harsh, petitgrain is made from the leaves of bergamot citrus). The fruits of Yuzu are very fragrant though (like a mixture of sour orange, Satsuma mandarin, lemon, and maybe a hint of grapefruit sweetness, and also it is a pungently deep spicy smell). You are most likely to have 100% germination rate with these (although the Yuzu has been in the refrigerator for over 3 weeks now, which might affect chances of germination). Apparently Haggen is carrying "Yuzu Lemons". They don't look very ripe, but they are loaded with lots of fresh seeds inside. Last week they were also carrying Buddha's Hand citron. The lowest the Winter temperature got down to was 28 F. There was some frost on the surface of the soil. He didn't bother protecting any of the plants. His bananas also look good too. He's also growing oranges and a macadamia nut tree. This post is about how to breed seedless bananas for temperate climates, a rough outline idea. Select a cold-hardy banana (such as Musa basjoo) and then select another "edible" (good tasting, but seeded) banana which is very early ripening (perhaps Helen's hybrid). Treat the apical bud with either Colchicine or Oryzalin to double to chromosome number, obtaining a tetraploid. "Tetraploid plants were induced successfully from diploid bananas Musa acuminata ‘Kluai Leb Mu Nang’ and ‘Kluai Sa’ (2n = 2x = 22) with in vitro oryzalin treatment. Calluses from in vitro-grown shoot tips of both cultivars were treated with oryzalin at concentrations of 1.5 or 3 mg l−1 for 24, 48 and 72 h, respectively. The oryzalin treatments produced tetraploids at a frequency of 15.6% in ‘Kluai Leb Mu Nang’ and 16.7% in ‘Kluai Sa’ as detected by flow cytometry. Chromosome counting showed that the tetraploid plant chromosome number was (2n = 4x = 44). The selected tetraploid plants were transplanted in the field and variations in the morphological characteristic of leaf shape and fruit bunch compared to normal diploid plants were found under the same growing condition even after 3 years of cultivation." When a normal diploid is bred with a tetraploid, the result is a seedless triploid variety. "Most bananas purchased at your local supermarket came from sterile triploid hybrids." This is a coconut palm growing in a pot in Santa Ana. It had been outdoors for 3 years, at the time this picture was taken (Sept 2010). The half whiskey barrel it is planted in is filled with pure sand, the idea being to make sure the roots are well drained. Trunk is 2 inches thick and tree is about 4 feet high. Looks bigger and healthy with four large fronds. Mark M. of South Oceanside Palms nursery bought and nursed a little coconut palm for 3 years, then planted it in the ground against a south facing wall on the side of a building. After 8-9 more years it grew to about 13 feet. In Desmond Muirhead's book titled "Palms", he points out that the Coconut is of the tropics and that it remains stunted on the Baja down to La Paz. He goes on to point out that it is not the extreme low temperatures that doom the Coconut in California but rather the extended cool time frames. Numerous attempts were made by many businesses in the 20s to 40s to try to import and grow coconut palms in California without success. But perhaps the regional climate of Southern California has warmed due to all the development that has taken place over the years. For example, Blenheim Apricots that used to be commercially grown in orchards 70 years ago now seem not to do as well and do not get enough chill hours. There were several coconut palms growing near the inland Salton Sea (in proximity to the southwest shore). The fronds didn't look very lush but they seemed to be doing okay. A number of years later, however, they all died due to not being watered. Renters moved in (you know how that can go) and the palms didn't get the care they needed. Then the house became abandoned after the area fell into economic decline right after the housing crash. I think coconut palms don't need that much humidity, they would do just fine anywhere within 15 miles from the coast in Southern California if it weren't for the extended cool winter temperatures. I think cool and wet is what does them in. Maybe they'd be able to survive here if we had our dry season in the winter instead of the summer. Of course they like a bit of humidity if it's warm. 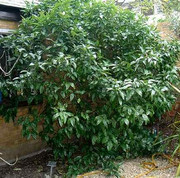 There is a grapefruit tree growing outdoors, and which produces fruit, in the Chelsea Physic Garden, located in London. A little bit of information about this grapefruit, it started off as a seedling sown in 1948 and kept in a pot until 1990, when the original owner died. It has fruited regularly every year since 1998. It has been nick-named 'Aunt Queenie'. The tree is located in a sheltered corner up against a brick wall under the protection of a large olive tree, and produces regular crops of large yellow fruits that hang for months on its branches. With the thick pith and small fruit size, it doesn't look like those fruits are ripening very well in the cool climate. A couple of possible factors that may be contributing to it being able to grow so far North: it is located in the center of a large city which probably has an effect on the localized climate, the garden is located next to the Thames river which may be having a moderating effect on the nearby temperature, the tree is growing in the corner of a sheltered walled garden. The fact that it was grown from seed and is not grafted onto a different rootstock might also be making the plant more vigorous and resilient to the cold. 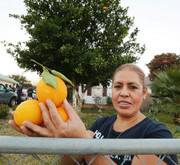 Since it is a white grapefruit, the variety it was sown from was most likely Duncan or Marsh, which are a bit more hardy than other common grapefruit varieties. I have theory. I don't have any evidence for it, but let me share the reasoning for it. Among different citrus varieties there are some which produce a higher percentage of nucellar seeds than others. Some citrus species produce entirely zygotic seed, while other varieties produce almost entirely nucellar seed, and there are several varieties with percentages in between. If the seed is nucellar, it will be a genetic clone of its parent. Not really a good thing if you're trying to hybridize new citrus varieties, but a good thing for those growing rootstock from seed, where uniformity is important. The reason, it is believed, some citrus varieties form nucellar seed is that the sexual gamete cells inside the seed are not vigorous enough and can't compete with the nucellar cells. The original origin citrus species are, almost entirely without exception, all zygotic. But when different citrus species are hybridized the percentages of nucellar seed shoot up. This could be because the hybridization between different species (which are not entirely compatible) results in a weaker gamete (megagametophyte), and so the nucellar lining takes over. My theory is that if a hybrid citrus flower is pollinated with pollen from one of the original two species from which the hybrid originated from, the percentage of nucellar seed is likely to be lower. This would be because, the genetic composition of the megagametophyte would be less heterogenous, and thus presumably have more vigor. So, for example, if Yuzu were pollinated by C. ichangensis, there might be some zygotic seeds form in the Yuzu fruit. If this theory is true, this may confer some advantage to hybridizing new citrus varieties, since normally trying to hybridize a variety that is highly nucellar and using it as the female parent presents some pragmatic challenges.